commented on "Upholstered Seat Panels for Sports Shop Bench Seating." 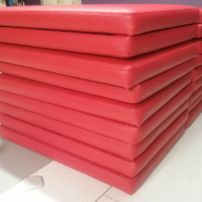 Upholstered Seat Panels for Sports Shop Bench Seating. Need new upholstered panels for your bench seating? We can make all sizes and thicknesses to suit your requirements. Fabric, Vinyl and Leather coverings available in a large range of colours. Talk to us about your requirements!